← Am I A Freak of Nature? The First Amendment protects, among other things, the freedom of speech. It does not demand that you speak, it only protects your right to do so. It does not require that you obtain a permit to speak nor does it require that you register your speech with the government. It also does not limit how many words you can use when you speak, or write an article or book. Free speech cannot be restricted simply because another takes offense at what you say. However there are some common sense rules that one should apply when exercising their right to speak freely. For instance, one should not burst out with a sudden inspired oration during church or while in a movie theater as it would disturb the others in attendance. One should not speak falsely about the character or actions of another as that is slander or libel. But other than that, free speech is just that…free and unlimited. Why is it then that people will stand up for their right to speak freely, but then turn around and be so eager to see the right to keep and bear arms slowly but surely taken from them? Before you answer it must be understood that those who wrote our Constitution, and those who demanded that a Bill of Rights be included, were very conscious of the importance of the things they were including in those documents. You have the right to eat, the right to breathe, the right to wear clothes to keep you warm…so why didn’t the Founders include those rights as well in the Bill of Rights? They didn’t because they were commonly accepted as being among our natural rights as human beings. The rights they did include in the Bill of Rights were those that were also amongst our natural rights, but were those which may be subject to violation by those who would seek to tyrannize and oppress a people. Our Founders included those rights because they were not necessary for our sustenance, but for the survival of our liberty. 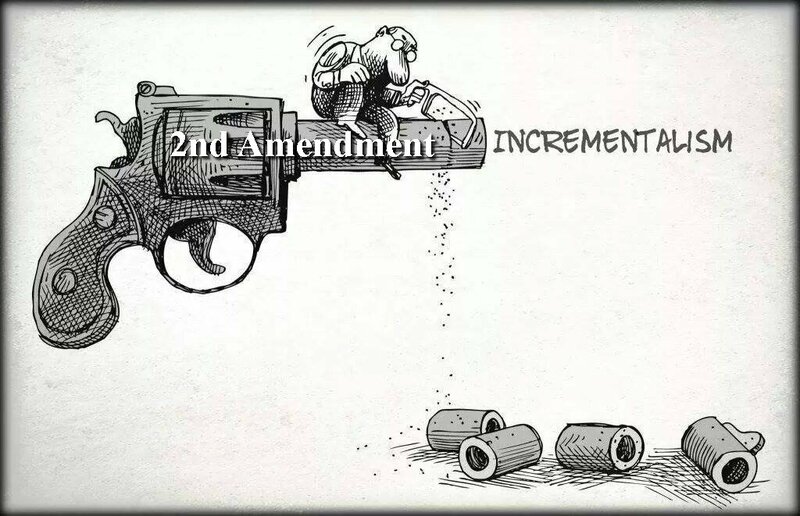 So again, why is it that so many of you are so eager to see more and more limitations imposed upon the right of people such as myself to keep and bear arms? I do not claim to be a lawyer or an expert on the law…not as it has been written by men anyway. There are simply too many subcategories of law for me to even begin to understand them all. Have you ever had occasion to visit a lawyer’s office? I have. I once had to get some legal documents prepared for my wife so her father could come to the U.S. from the Philippines. When I was in his office I saw entire bookshelves filled with bound volumes of law books. I asked him if they were all the law books ever printed, to which he said, no, they were just the ones for civil law. You see, there is civil law, criminal law, business law, maritime law, international law, etc, etc. To become acquainted with all the laws ever written would take ten lifetimes and even then new laws are constantly being written or old laws are amended and updated. So, understanding every law is something nobody is really capable of. How can a person be expected to abide by the law when the laws being written are so complicated you cannot make heads or tails out of them? How can a person be expected to abide by the law when they are constantly being amended or updated? And more importantly, how can you be sure that the laws are even legal if you don’t understand the nature and purpose for which laws were to be written? If you don’t understand that, how can you even know that by certain laws being written the lawmakers themselves are not guilty of violating a fundamental law? This is no more important than when it comes to laws being written which restrict a person’s right to keep and bear arms. Gun control laws, as you are fond of calling them, are not written based upon a legal right to limit, or restrict, ownership of guns. Instead they are written because of an emotional desire to control crime and provide you with a measure of safety in your lives. They are knee jerk reactions to a specific event in the hope that by passing a ‘new’ law that you will prevent another tragedy from occurring which takes the lives of innocent people. You either stand for freedom, or you do not. If you say you believe in freedom then a person has the right to say whatever they want, wear whatever clothing they want, eat whatever they want, and own whatever type of firearm they want. You can’t have it both ways. You can’t say that a person can eat, wear, listen to, or say whatever they want, but they cannot own this, or that, type of gun. As Jefferson said in our Declaration of Independence, government is instituted to protect our rights…all of them. There are many forms which government may take, but ours is unique in that it was a system where the ultimate power and authority lay with the people, who elect representatives to act in their behalf, while being limited by a written law; a constitution. When I speak of the Constitution I can almost picture people thinking about that piece of parchment on display at the National Archives in Washington D.C. People view the Constitution more as a historical relic than an actual law which is binding upon us all. People pick and choose which parts of it they want to be relevant in their lives and disregard those that they do not like. But we cannot do that; either we have a Constitution and every clause in it is binding, or we don’t. If we don’t, then our government ceases to have any authority over us because it only exists because the Constitution created it. What is law, and the purpose for which laws are instituted? In 1850 noted Frenchman Frederic Bastiat wrote “What, then, is law? It is the collective organization of the individual right to lawful defense.” But he didn’t stop there, continued by saying, “Each of us has a natural right—from God—to defend his person, his liberty, and his property. These are the three basic requirements of life, and the preservation of any one of them is completely dependent upon the preservation of the other two. For what are our faculties but the extension of our individuality? And what is property but an extension of our faculties? Our Founders hoped that our Constitution would survive the ages, that its balances of power, the checks each branch held over the power of the others, and the rights it protects in the Bill of Rights would be enough to ensure a lasting form of republican government. It would, only if people understood it, and held those they elect to the limits it imposes upon them. Whether you understand the Constitution or you don’t, whether our elected representatives understand it, or they don’t, the fact remains that it is still the law and therefore if we violate it, or allow it to be violated by our agents, we are criminals, or at the least accomplices to a crime. It matters little whether your intentions be good, you are guilty of breaking the Supreme Law of the Land if you ask that any of its clauses by violated, or any of our rights be restricted. Therefore, if the Constitution is the Supreme Law of the Land, and therefore, if an amendment is duly ratified by the states and becomes part and parcel of the Constitution, it also becomes the law of the land. Finally, if, as it says in Article 4, that the citizens of all states shall enjoy the same privileges and immunities, do you for a minute believe that a right which is protected by Constitutional amendment should not be equally enjoyed by the citizens of every state? How then can you explain the various laws which some states enact upon gun owners while other states have no such restrictions? Does that sound like it is equal among all the citizens to you? There are laws in my home state that prohibit me from owning magazines of a certain capacity that people in the neighboring state of Nevada do not have. There are certain firearms that were I to live in Texas I could purchase, but being as I live in California they are considered illegal. Some states allow for open carry, while my state does not. I ask, is this equality? And I haven’t even begun to discuss the myriad laws which say under what circumstances people can use firearms in their own defense, and the criminal charges that will be brought against them if they do. Again, where is the equality in all these different laws? The Second Amendment only states that the right to keep and bear arms shall not be infringed. It makes no mention of what type of arms, nor does it place limitations upon a person’s right to carry an arm on his person for self-defense. It makes no mention of requiring that firearms be registered, nor does it say that you need a permit to ‘bear’ one. As I asked earlier, do you need a permit to speak in public? If not, then why do I need a permit to carry a gun? After all a right is a right is a right…if the Bill of Rights does not state that a permit is required, THEN NO PERMIT IS REQUIRED! Permits, registration of firearms, limits upon what type, caliber, or magazine capacity are all laws passed by government, often at the request of a panicked citizenry after a shooting, to make the people feel safer. Yet they are all unconstitutional infringements upon a right. In the landmark case of Miranda v Arizona the Court ruled, “Where rights secured by the Constitution are involved, there can be no rule making or legislation which would abrogate them.” This applies equally across the board to all our rights. According to that you cannot vote upon the elimination or restriction of a right. Our legislators cannot pass legislation which even touches our ability to exercise a right. And the courts are required to apply those Constitutionally protected rights, not attempt to interpret to what extent the people can exercise them. So when it says the right to keep and bear arms shall not be infringed, it does not mean that the courts can interpret that to mean only under certain circumstances, and with certain limitations placed upon it. 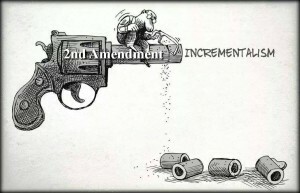 Shall not be infringed means exactly what is says, which is do not attempt to interpret, or limit it! Notice that they do not say the disarmament of the people, they cloak their goal under the guise of eliminating gun violence. That is something everyone can agree upon and support, the elimination of unnecessary deaths caused by the misuse and abuse of firearms. But to punish those who have done no wrong, to restrict their ability to freely exercise a right because others are not as responsible as we are is wrong, and it is unconstitutional. Can I demand that your freedom of speech be taken from you because you have not taken the time to research a subject, or because you are an idiot? No, I can’t. Neither can you demand that a law be passed which violates my rights because someone else abuses theirs. Each person should be judged according to their actions, not the actions of others. Passing new gun laws will not solve crime. Just look at the following example. Chicago and Houston Texas are similar in size, in racial makeup and population. Yet Chicago has very strict gun laws and Houston does not. If gun laws worked then you would think Chicago would be a much safer city. It is not. Crime is higher across the board and deaths caused by guns are as well. The fact is that criminals prey upon the defenseless. If you take away a person’s right, their ability, to defend themselves then America will become a haven for those who prey upon the defenseless. It does not matter how many gun laws are passed there will always be those who are violent by nature and who will not adhere to the law no matter how harsh the punishment. Would you see all responsible gun owners punished because of a few bad apples? Responsible gun owners view the taking of a human life as an act of last resort. But we also believe that it is right to do so if our lives, our property, or our liberty is threatened. Unlike most Americans, most of the gun owners I know are educated as to why the Founders included the Second Amendment among those submitted which eventually became the Bill of Rights. It was not to hunt, nor was it to protect our homes against crime, although these are secondary benefits which the right to keep and bear arms provides. No, the right to keep and bear arms is a failsafe, a last resort should our Constitution fail and the people need the ability to defend themselves against tyranny, it is the one right put in place which allows for the defense of all the others. To say that we should not be allowed to have high capacity magazines, so-called assault rifles, short barreled shotguns, and all the other limitations gun control laws place upon us defeats the purpose of the Second Amendment. Had the British had automatic weapons…had the South had automatic weapons, do you think there might have been a different outcome to the War for Independence and the Civil War? God forbid that another war occur on American soil, but should a rebellion occur how well would one side fare when they are limited to single shot rifles and pistols while the government has access to the latest and most advanced military hardware? You may not understand these principles as all you are concerned with is making America a safer place for you and your children. That is a noble cause, really. But unfortunately your methods are misguided and faulty. There will always be evil and evil does not care about laws. The best defense is to be prepared for evil and willing to defeat it with the same violence and force that it would bring to you. This is true whether you are talking about the common criminal, or the kind that hold elected office. Gun control laws, no matter how small and insignificant they may appear, are a direct attack upon a constitutionally protected right… they are criminal acts by those who have sworn an oath to protect those rights by supporting and defending the Constitution. Whether you see it that way or not is irrelevant, the facts support this point of view. But, let it be known that if you make the claim of being a freedom loving American, then turn around and support any measure which infringes upon my right to keep and bear arms, YOU ARE A HYPOCRITE! And if you are successful in having measures passed which do just that you are either a criminal, or an accomplice, who is guilty of breaking the Supreme Law of the Land and are unworthy of calling yourself an American. In closing I would like to leave you with two quotes from the Sixteenth American Jurisprudence, an encyclopedia of law and legal maxims. You may not care, but we, the gun owners of America hold these principles to be true, especially as they apply to any efforts to limit our ability to freely exercise our rights. “The general rule is that an unconstitutional statute, though having the form and name of law, is in reality no law, but is wholly void, and ineffective for any purpose; since unconstitutionality dates from the time of its enactment, and not merely from the date of the decision so branding it. Keep these thoughts in mind the next time you consider casting your support behind even stricter gun control laws.